In October last year I revealed here exclusively that Hyperion were recording the Violin Concertos of the Russian Schoenberg, Mikolai (Nikolay) Roslavets, played by Alina Ibragimova. That CD is now scheduled for November 2008 release and the sleeve is seen above. For years the dated artwork on Hyperion CDs has been their only weakness, so the 'new look' for this release is particularly welcome. There is more on Roslavets claim to be the originator of serial composition in my earlier article. Judge for yourself whether he was the Russian Schoenberg by listening to the generous audio samples om the Hyperion website. Hyperion and other independents continue to show the major labels how it should be done. In January 2009 Hyperion are re-releasing at mid-price a double CD of the complete symphonies of the French composer Albéric Magnard who was born in 1865. Magnard's compositions include the four symphonies, an opera (Guercoeur) and a string quartet. He moved from Paris to the peaceful Oise area of France to continue composing and was living there when the First World War broke out. As the German forces approached the area in 1914 he sent his wife and two daughters to safety. After shooting two German soldiers who approached his property he refused to surrender. His house was set on fire and the blaze consumed almost of all his manuscripts and art collection as well as Magnard himself. Something to reflect on, perhaps, for some of today's self-styled dissident composers? I came to know Magnard's music through a 1983 EMI Pathé LP of the Fourth Symphony made by Michel Plasson conducting the Orchestra of the Capitole, Toulouse. The coupling is Magnard's Chant Funèbre Op. 9, a magnificent fifteen minute tone poem which is crying out for an enterprising orchestra to programme. Also in my LP collection is a French Decca LP recorded in 1969 of Magnard's Third Symphony by Ernest Amsermet with his legendary Orchestra of the Suisse Romande. The Toulouse cycle of the Magnard Symphonies has also been transferred to CD. But Plasson's account of the Fourth Symphony in the original German Teldec DMM vinyl pressings plays on my Thorens TD125 turntable as I write, and it sounds pre-digital terrific. The work dates from 1896, and it certainly isn't proto-Schoenberg. But, as they say on Amazon, if you like the red-blooded romanticism of Erich Wolfgang Korngold's Symphony in F, which was composed 50 years later, you'll like this. But decide for yourself via Hyperion's samples from all of the symphonies. The orchestra for both the Roslavets and Magnard releases is the BBC Scottish Symphony Orchestra who, like Hyperion, continue to show the big names how it should be done. There is a final vinyl link in the Hyperion release schedule. 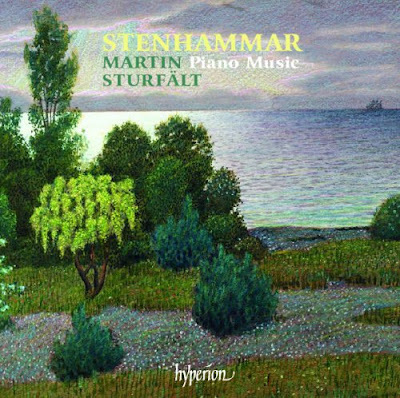 November 2008 brings the new recording of Wilhelm Stenhammar's piano music seen below. I featured BIS' cycle of Stenhammar Symphonies on LPs in my recent post, Excelsior! Fascinating article, Pliable. 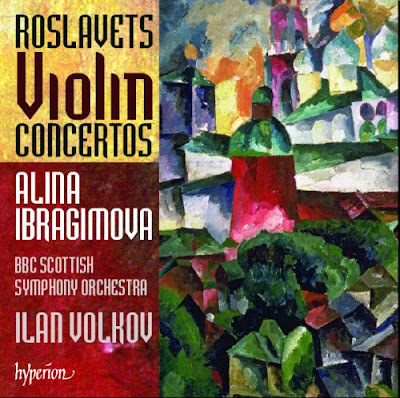 I look forward to listening to the Mikolai Roslavets violin concertos next month. I also believe that I have a Albéric Magnard recording, but I will need to locate it, as I don't recall it now. Regarding Roslavets, just yesterday I was reading about Valentin Silvestrov (in either the Grove article by his deceased wife, musicologist Larisa Yakovlevna Bondarenko or the Etcetera label [Amsterdam] recording of his three string quartets), and the article noted that Roslavets had exerted a huge modernist influence on Ukrainian music while directing (or teaching at) the Kyiv Conservatory of Music in the 1920s, following Reinhold Moritzevich Glière's directorship in Kyiv from 1915 to 1920. I'm not able to confirm this now, and I wonder if the Etcetera writer could possibly have been confusing Kyiv and Kharkiv (which was a huge center of Soviet Futurism in the 1920s), though I imagine this unlikely. Maybe one of your readers who follows Soviet musical matters carefully and can clarify this. I checked, and it was British music scholar Malcolm MacDonald who wrote (for Etcetera Records in 1992), that Mykola Roslavets (1881-1944) was director of the Kyiv Conservatory of Music -- I assume for part of the 1920s between the directorships of Reinhold Gliere (1914 — 1920) [who was of German-Polish ancestry] and Borys Lyatoshynsky. I found the link to the extensive Hyperion program notes to the Violin Concertos after following your link, Pliable, to the Hyperion sound samples (which I haven't had time to study). Fascinating post. While I'm happy that Roslavets has finally begun to receive his just due, I am thrilled to see Hyperion carrying on doing what it does so well after the unjust legal debacle of its recent past. In producing recordings like this and the York Bowen 4th Piano Concerto, Hyperion shows they are still at the top of the game. Bravo to them!